Bar Gastronómico Korgui is a modern restaurant offering Mediterranean cuisine. The average price of a main course dish at the Bar Gastronómico Korgui restaurant is 12 euros. The average price of a 3-course meal at the Bar Gastronómico Korgui restaurant is 30 euros. Note that although GoMadrid.com strives to maintain all information about Bar Gastronómico Korgui up to date, the prices mentioned are only an indication and may not reflect the exact value of your meal. Restaurant and bar, located in the historic centre of Madrid and offering traditional Mediterranean cuisine mixed with Mexican and Japanese dishes. The menu comprises tapas, salads & pastas, and grilled meats together with certain Mexican and Japanese options. It is also possible to eat outside on the terrace. Korgui is a modern restaurant in Madrid's oldest district - the 'Barrio de los Austrias'. Its minimalist, radical but welcoming design promises a relaxing dinner or a good place to enjoy drinks and an aperitif with friends. In summer the pleasant terrace is cooled by a water vapour system to take the edge off the summer temperatures in the capital, making the most of the pedestrianised area where it is located. The menu varies but Mexican and Japanese flavours tend to influence the Mediterranean cuisine which predominates. Nearly all dishes are prepared in 'tapas' format to allow diners to sample a variety of options. At midnight it becomes a bar serving delicious cocktails, such as its famous Mandarin Daiquiri, where you can while away the night to some of the hottest music. 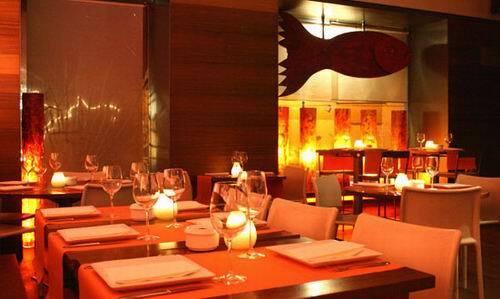 The address of the Bar Gastronómico Korgui restaurant is: Calle Rollo, 8, 28005 Madrid. The nearest Metro station is Opera. Please see the Bar Gastronómico Korgui restaurant location map below.